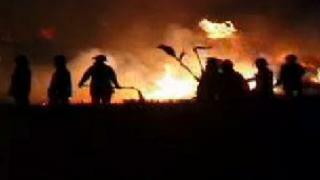 Firefighters dealt with numerous gorse fires in Cornwall at the weekend. The biggest incident was on Sunday at Newmill, near Penzance, when more than 70 firefighters spent about 12 hours dealing with a fire on Treen Common. Crews were also called to multiple gorse fires near Penryn, which may have been started deliberately, they said. Cornwall Fire and Rescue Service said there were also gorse fires at Bolventor, St Dennis, Gurnard's Head and Coverack. At Coverack there were two separate areas of fire at Lowland Point - one fire covering half a hectare, and the second covering one hectare. The brigade said the fires were being fanned by winds. March is classed as a "key period" for wild fires in the county, when many farmers carry out controlled burning or swailing as a way to manage the land. But more than half the 81 wild fires the brigade dealt with last March were classed as suspected arson.